BlitzMetrics serves sports teams, colleges and anyone who has existing digital conversion paths that they want to squeeze more yield from. Social advertising is about amplifying what’s already working, so their best clients have PPC and email efforts that produce, which they move over into Facebook, Twitter, YouTube and whichever channels drive measurable conversions. 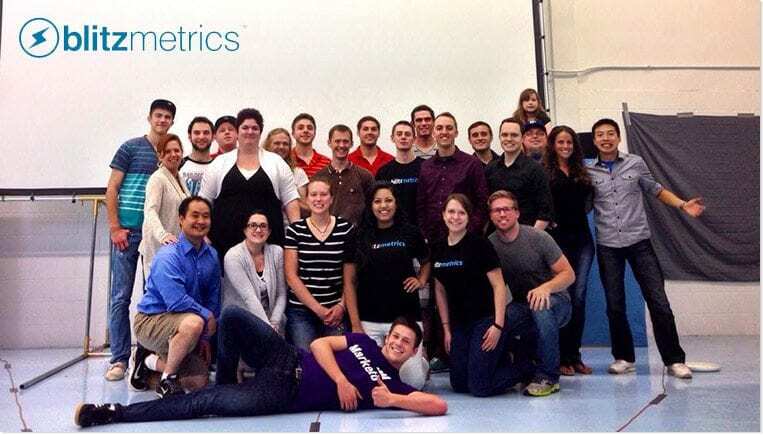 BlitzMetrics is a group of highly-trained analysts, not salespeople or call center people. The person you talk to when you come onboard is the same person who works with you on an on-going basis. They are paid according to how well you do, just like your clients are. From our experience working with them, their passion at BlitzMetrics is on training students with real-world experience at no cost to them – funded by packages. They do this for many types of businesses: Pro sports teams such as the Golden State Warriors, and other big brands like Rosetta Stone and Fuddruckers, and apply the same level of care to smaller businesses, with the same results. Small businesses don’t have a lot of money to spend, yet they want a solid online presence, a site that shows up in search engines, strategies that make the phone ring, and in general, a measurable return on their hard-earned dollar. They want something that is simple to understand. And they don’t have time to learn all the technical details, but want a team that can handle it, because they have a dozen other things to worry about. BlitzMetrics also helps people discover the power of content marketing, and share their passions with the world by building a network of thought leaders. Then, they become experts that others look up to as an authority and begin to ask them their thoughts. If you have at least $1 a day to spend for online marketing and are willing to work with our friends at BlitzMetrics while they gather information that you’ll need to present to your clients and customers, then they would love to help you grow your online presence! If you’re a franchise with many locations or if you’re a professional service firm that is willing to spend money on advertising, they have a few other options, as well. Call today for more information at (720) 336-0775.